Mary Louise Couey, born August 7th in Mobile, Alabama, died May 26, 2010 in Mesa, Arizona. She is survived by her dear husband of 52 years, Joseph Couey, her daughter Elizabeth Kelly Slade (Darin), her 7 grandchildren Ciera Eppinger (Tim), Joseph, Elizabeth DeAnn, Jacob (deceased), Joshua, Rylee and Jocelyn Slade. Mary Lou was a veteran in the United States Navy for 3 years and worked in the Civil Service for 23 years. She loved to travel, play golf and dance. She had recently started painting. 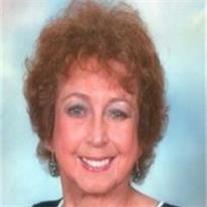 Mary Lou loved life to the fullest; she was loved very much by her friends and family. She was a past member of the El Zaribah Daughter of the Nile and Ladies Oriental Shrine. She was a current member of the White Mountain Women’s Club. Mary Lou suffered with Pulmonary Fibroses for 6 years; she was a fighter and fought hard to overcome this horrible disease which there is no cure. In lieu of flowers please donate to the Arizona El Zaribah Shrine Clowns. Funeral Services will be held at Bunker’s University Chapel, 3529 East University Drive, Mesa, AZ 85213 on Saturday, May 29, 2010 at 10:30a.m. A viewing will be held on Friday, May 28, 2010 from 6:00-8:00p.m. at Bunker’s. She will be laid to rest at the National Memorial Cemetery of Arizona on Tuesday.